This is the modified dash cluster from Murphy, the $500 87 Subaru Turbo Wagon. The original cluster was an ugly greenish digital dash. I replaced it with an analogue dash from an 86. That dash normally has white numbers and white needles. I used amber bulbs to illuminate the numbers in an orange color, and placed red LED’s behind the needles to give them a reddish hugh. Yes, including the rewiring of the dash harness from digital to analogue, it was a lot of work. But it was worth it. Here is Murph, trudging around in the Mojave desert. Not that I’m done modding Murph, but there is another car waiting for a chance at a new life. World, meet Red, the $300 Subie Alpine Wagon. I have had this car since September… sort of. Due to registration snafu’s (will write about that later) it has taken 6 months to finally gain legal ownership of the vehicle. But if all goes well, fingers crossed, the last bit of paperwork will be signed off by the powers that be (read DMV) and Red will legally be mine. The engine has long since stopped running – it’s D.E.D. dead! This week-end I will be pulling the old engine out, and prepping the car for a transplant, sometime after next week. Tesla’s inventions and ideas make so many modern appliances and conveniences possible, it is impossible to list them all. 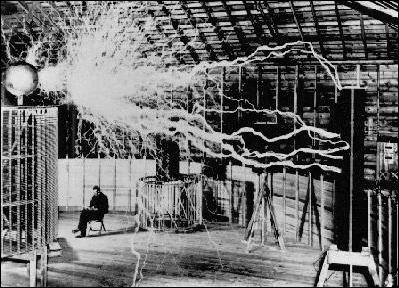 Without Tesla’s innovative spark, the modern world would be a very different place. Since all our electrical energy is supplied via Tesla’s Alternating Current, and there would almost certainly be no TV, no Internet, energy saving fluorescent bulbs, or washing machines. The spark plug and coil system under the hood of you car is a direct descendant of Tesla’s work. Tesla’s work on the electronic AND gate paved the way for the computer processor. It is likely he invented the radio ahead of inventor Guglielmo Marconi. He even invented a “Death Ray” (I want one). Here is a small list of some of the patents by the forgotten genius. PS. The Tesla legacy lives on – Fast Cars and Rock and Roll. Ahhh. The results of a generation raised on Whole Language based education. Hecktic Topsy-Turvey Week and the Class From Hell. Here is the goings-on in life, good and bad. Good – If all goes well, I’ll be selling the truck tomorrow. Also have a couple of spa repair jobs this week to bring in needed $$$$$$. This is great because the last few months have been a financially tight… no, a train wreck, and my bills have been piling up with a few lapsing into overdue status. If all goes well, after five months of DMV bureaucratic snaffu’s, next week I will finally become the legal owner of “Red”, the dead 94 Subaru just waiting to be brought back to life! (it’s what I do). Bad – Horrible outing as sub this last week. I haven’t written much about my experiences as a sub. I’m not sure why. I had intended to on many days when things happened. There was the first time I sent a kid to the office. There was the time my car was tagged with a dry erase pen (pointless and humorous as it wiped right off). There are many days when you see the great potential of our youth, when you see how smart and world wise these kids are. Many days when the students and I bond and share a commaradery. Man those are fun days, when you see how good the future will be as many of these kids grow into adulthood and take the reins from the overbearing, hypocritical baby boomers. This week I’m writing because my subbing experience took a break from all that satisfaction and descended into hell. Tuesday: Someone in period two stole my keys from my desk, which also had the classroom keys on the chain. I didn’t discover the keys were missing until after third period, but that class did not have the wander-lust displayed by second peroid, so I’m pretty certain they were taken during second period, and if I am proven wrong I will apologize. Wednesday: Sub’d in the same classes. Big mistake. On Tuesday, some of the students were called into the office and questioned about the missing keys. The class was mad that they were accused of stealing my keys. The students claimed innocence. Toward the end of class, after several warnings to the students against cell phone use, I confiscated one from a student, using it in class. The user of the phone was not the owner; she had borrowed it from another student. The owner of the phone was ticked, but I had warned them not to use the devices, and they are all aware of the rules on device usage in class. I put the phone in the teachers desk. One student in the middle of the room (loud, boisterous, but also a hard worker) asked for assistance on a problem. I went over to help her. As I bent over to check on the check on the question at hand, someone to my right, just outside my field of view, threw a paper airplane at me, hitting me in the face and cutting my cheek, missing my eye by less than two inches. I was pissed. I walked over to the area where the plane had come from. Me to students: “Who threw the plane”? Student to me: “Oh My God – You’re Bleeding”! Me to student: “I Don’t care”! (makes me laugh thinking about it). I called campus security, but before they got to the classroom, the dismissal bell rang out and the students tried to leave. “Sit down right now! You’re not going anywhere” I yelled. (BTW, I never yell, told you I was pissed). Not only did the students clam up and not rat out the airplane thrower (didn’t think they would), but we soon discovered the phone I had put in the desk had disappeared. This is when the police were called in. The students were frisked as each left the room, but the phone was not located and the airplane thrower was never identified. I guess this was not unexpected, as the police and campus security figure the owner of the cell phone would be caught again using the phone, and someone will give up the identity of the “pilot” when leaned on outside the comfort of peer protection. And, since the phone thief and the airplane thrower did not volunteer to come forward when given the chance, those students, when found, will most likely get expelled when caught. Bummer for them. I just wish someone would have had the decency to return my keys, no questions asked, and maybe none of the other stuff would have happened. For My Brother In Law…. … grab the litter box! … racing a parked plane. We won!.